I was born in pokali VDC of okhaldhunga district B.S 2038. The name of pokali VDC is founded by pokali fall. The fall is second tallest fall of Nepal and is 130m. People of okhaldhunga and other nearest district, worship the fall and also see the natural beauty of the fall .. Still now I remember the event that happened to me when I was 7 years old. A old man like a red monkey approached me . I felt , he was pulling me toward pokali fall. We both went like rope way. Suddenly a cave appeared and we both entered there.Inside the cave there was female means the wife of the man who took me to the cave.firstly I couldn’t see her because herattiude revealed her devilism.Inside the cave we both remained as teacher and a student. He taught me many more about his knowledge. Inside the cave, I learnt many mantras taught by him because he was none other than a banjhakri. In simple language we can know him as jungle god. People say that pokalifall is traditional home of banjhankri. Other castes and religions also go there and worship on their own way. I got knowledge from pokalifall and banjhankri who lived there.after getting the knowledge from the ban jhakri I found ashram nepal an institution who serves the local ones who are suffering from the problems of present ,past and also forecast future incidents, love problems , divorce, addictions of various drugs and drinks ,sterility problems in females,loss in business matters,other family problems and many more. Since I got knowledge from pokali fall I founded pokali fall service society in 2063B.S. and worked there as a president for 2 years. This society is mainly concerned with social services. I was born in pokali VDC of okhaldhunga district. Pokali VDC was named from the pokali fall .Pokalifall is religious and tourist area. It is the second highest fall of Nepal . All highest fall do not show their effectivness .But pokalifall possesses all these.It has both religious and natural importances. The amount that is provided by Nepalese government for the progress of pokali VDC is misused by the people under the vdc committee,so I decided to make an icon eye on those people who misuse the budget. Pokali jharna seems from eastern Ramechhape district. When pokali jharna falls its shape changes and takes shape of river.pokali mixes with liku many farmers' god hand in pokali. How pokali name became famous? There is strange story of pokali fall. Near the pokali jharana there is big sunuwar village.in sunuwar language ''po'' means pig and ''kali'' means site of garbages.It means it is the place where the pigs do their dirty works . Instead of knowing the religious and natural importance of this fall the local people go to badri and kedarnath. My life is linked with poklai. I got knowledge from banjhakri spending seven month. My student are American Japanese European and other .I am only the person who frequently visits the foreign places I have already gone to 38 states .Whereever I go I talk proudly about pokali fall and its importances .since this fall has changed my life. For me pokali is my pride my glory and my deep respect..
Rafting-Rafting in Sunkoshi and Botekoshi attracts the tourist in Nepal. 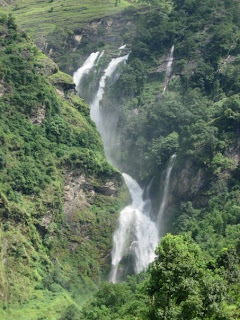 Water-falls – Pokali water-falls attracts the tourists who are religious and loves natural beauty. 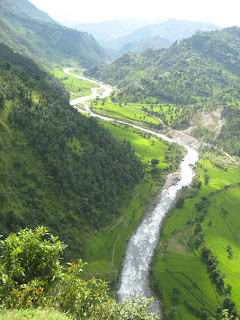 If Pokali water fall could be advertised within Nepal it would relief the public of Okhaldhunga. We can take an example of Pathibhara as a symbol of Devi temple in Taplejung district, the public in Ilam named it as Pathibhara. Visitors from Darjaling and Sikkim visit Pathibhara, this shows that if people have unity the work becomes successful. Gadhi - Historical corners “gadhi” are found to be constant. Repair and maintenance of gadhi could attract the tourist. Chasankhu gadhi of Diyale and Kotkateni gadhi of Thulachhap are also found to be not well taken care of. Cave - Cave has great significance throughout the world. Our ancestors used to live in the cave and wodhar। One of the most popular cave of Pokhara “Mahendra gufa” has demonstrated of attraction of tourist towards cave and wodhar . Chameru Gufa of Okhaldunga Bilandu has proved to be playground "kridasthal" of chameru. The darkness inside the chameru gufa makes it difficult for people to go inside. If proper arrangement could be done, travel would be convenient for the people in the district, and it would make it possible to collect the money as well. Religion- Okhaldhunga has a lot of religious conviction center. After Kathmandu the most faithful conviction center and शकि्र पिठहरु should be in Okhaldhunga district. The most popular Pokali water fall and forest shaman cave “ban-jhakri gufa” are found in the district, we have established an institution, “Pokali Jharana Sewa Samajh” to spread the information of these beauty and also to help the sufferers and the orphan locally. Okhaldhunga has the most faithful temples; Shree Champadevi temple in Bilandu -9, Kotika Kalika Devi temple in Chisankhu, Jageshwar Mahadev temple in Salleri Laglage, Pokhara devi temple in Tin Kanya Devi temple Pokhara-1, Namaideshwor Mahadev temple in Singhadevi Temple, Kuibhir -5, Mahadev temple of Thulibanshi in Bunnam and Kuntadevi temple of Khudampa in Diyale, Samanawati devi temple in Barnalu-9, Raghuwireshowr Mahadev temple in Okhaldhunga bazaar, and Kalikadevi in Saraswati sthan, Jalpadevi in Bhimsensthan, Watuk bhairab Ganesh temple. Involvement of local government bodies and local people of Okhaldhunga in spreading the information of these temple to people is seem to be important. Social and cultural institution should also play leadership role in the process. Gumba - 15% of Buddhist are in Okhaldhunga and we have eight popular gumba which are also not well informed to the public. Some popular gumba of the district are Tolthol gumba, Riyal gumba and Dolakhark gumba of Patle, Kimardin gumba of Bhusinga, Ketuke gumba of Ketuke, Bhirkhark gumba of Khijiphalate, Ghunsa gumba of Baruneshwor and Lamja gumba of Ragani. These gumba attracts both national and foreign tourists, and nuns and monks. We need to do some fine-grained research studies on gumba of Manang, Mustang and Rasuwa. In reality it is not practicle for Okhaldhunga if you stay in a room like you would if you were to make a development strategy for national planning in Kathmandu. The reason behind this is only the local public of Okhaldhunga knows the taste of water, and they have love and affection for Okhaldhunga. These local public of Okhaldhunga live their life and send the last minute of their life in Okhaldhunga due to which they should be devoted in development of the district and spreading the information to help growth of the tourism. We should be free from our misunderstanding of the Government employees, they are not going to benefit Okhaldhunga nor are they going to view Okhaldhunga with a sacred vision. People living outside the district needs to spread the information of Okhaldhunga. Integrate the religious and racial unity in the district. Coordinate the plans and programs of Okhaldhunga to the Non-government organizations. A feeling of “Village development is development of your own home” should be developed. I am guru Kedar Baral, I am a shaman "Nepali Jhakri "and this blog is about my birthplace Okhaldhunga and my views. I am also actively involved in social work. Currently, I am also the president of Ashram Nepal, Okhaldunga.org and Pokali Waterfall Service Society. Please feel free to give feedback and suggestions.